Nowadays, more and more videos have been released in Blu-ray, for its large capacity and high quality. And it can be speculated that the Blu-ray momentum would be prevailing in the future. Recently, Macgo Inc has released Mac Blu-ray Player which made Blu-ray playable on Macs. At present, due to the urgent demand of users to play Blu-ray movies on iPhone/iPad /iPod touch, Macgo released Mac Blu-ray Player 2.0 version to satisfy all users. What makes Blu-ray movies accessible to iPhone/iPad /iPod touch is Macgo’s exclusive technical innovation – AirX. AirX is the core technology in Mac Blu-ray Player 2.0 version. It is the technology that can make Blu-ray movies be shared between Mac&PC and iPhone/iPad /iPod touch in the same Wi-Fi environment. AirX is easy to use, and you can follow the steps below. First of all, you should have a Mac&PC, an iPhone/iPad /iPod touch and an optical drive, and make sure that the Mac/PC and iPhone/iPad /iPod touch are connected to the same Wi-Fi. There are two options: Mac Download and PC Download. Choose the suitable version for your computer system and install it. 1) Open Mac Blu-ray Player and enable the AirX option under the ” Tools” menu before inserting Blu-Ray Disc™ or playing Blu-ray ISO or local movies. 2) Click on “Open File” or “Open Disc” button to launch the Blu-ray movie. It will take a couple seconds. When the loading is finished the screen will go black and then you can get the website URL “http://airx.tv “. 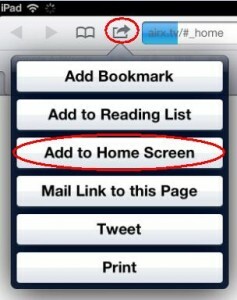 3) Open “Safari” in your iPhone/iPad/iPod touch and input the website URL above into it. Then the loaded Blu-ray source will be listed, you can enjoy Blu-ray movies on your iPhone/iPad/iPod touch now. 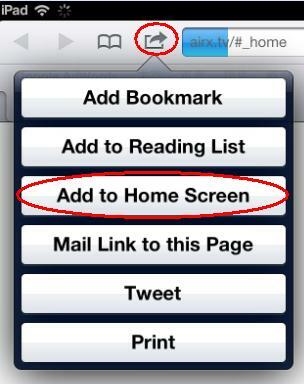 After watching the movie, you can save the URL as a shortcut on the home screen of iPhone/iPad/iPod touch, so that you can open the URL directly next time. « How to Play Blu-ray on iPad directly? @Ramon Rodriguez Please follow the below instruction: Click the “Video” from Mac Blu-ray Player Menu, and you choose the “Subtitle Track”, from there, choose the subtitle you prefer. I have owned the app and try to use AirX feature with my iPhone 3GS with iOS 6 but I got the message “AirX internal error”. I have tried these on home WIFI environment. My MAC is MacBook Air 2011 with Mountain Lion and it works fine any other features except AirX ? @Nu, Thank you for your feedback about the error of AirX, could you please send the error screenshot to our . Our Support Team will help you soon. Same problem here! Any solution yet? @Jannes, If you have any problem, please contact our support@macblurayplayer.com. They will answer you promptly. @Prasert Ruampakdeekul, could you please send your detailed information to our support@macblurayplayer.com. They will give your solution after receiving your detailed infomation. When i push the title movie on airx.tv url, jump a error message. @David Could you please send the screenshot of error message and your disc information to support@macblurayplayer.com. They will collect your problem and support you promptly. One more question, what do you mean when you say “disc information”? Your disc title, release date and the error tips. Own two licenses for BP. Trying to get Airx.tv to work but I get a dialog box on my iPad/iOS device that says the “operations could not be completed”. I am using safari and following the direction of the tutorial. What can I do? @Joe, As to the issue of AirX, please send the error screenshot and your internet condition to our support@macblurayplayer.com. They will help you as soon as possible. Got the same error in Safari and Atomic Web. Error just says “The Operation could not be completed”. Not sure what you mean by internet condition. I try to stream it within my Wifi. @Pete, we have received the same problem from our users and are trying to deal with it. Any progress, we will inform you, and thank you for your support. I have the same problem. When I enable AirX, I then insert a Blu-ray movie. The screen flashes black for about 1 second and then shows me the disc menu. If I try to go to http://airx.tv on my iPhone, I get “The Operation could not be completed” error. Then Blu-Ray player won’t respond and I have to force quit. Late 2012 27″ iMac, OWC Quad Interface Blu Ray burner. We have reveived some feedback about the AirX, and we have worked hard to make a sulotion. We will inform you in time for any progress. I bought the version 6 months ago and still no solution. I just installed AirX, and I can open the URL 127.04.0.2:20012 from my local mac but I cannot connect from my ipad… seems that the port is not reachable somehow… firewall on mac is turned off… mac is connected via lan cable and ipad via wifi at the same home router. Same problem as many others. Running an iMac and get the message on my iPhone “The Operation Could Not Be Completed” and the iPhone pinwheel just spins and the phone says “Loading”. That lasts forever. Any progress with a solution? It is now March 16th. Thanks. BTW…tried to play a standard DVD using Mac Blu-Ray Player software and it would not play. Used Apple’s DVD Player software and had no problem. This was using the same hardware player…a top of the line external CD/DVD-DL/Blu-Ray player/burner from OWC. Why can’t I play standard DVD’s using Mac Blu-Ray Player. I am using the latest release from March 14th. Maybe it’s a playback priority issue between Apple’s DVD Player and Mac Blu-ray Player. Please try to close Apple’s DVD player first, and then use Mac Blu-ray Player to play the standard DVD. You know that AirX doesn’t work with iOS6 yet you don’t mention it anywhere in your documentation, in fact, you appear to skirt around this problem in your replies above. You should make this public knowledge, because others, like myself, purchased this software in good faith expecting this functionality. I feel very sorry for it. But I also want tell you that we are devoted to solve this problem. When this problem is solved, I will inform you as soon as possible. Meanwhile, We have marked that AirX doesn’t work with iOS6 in our website. We believe we can conquer it, Please wait a few days.Thanks for your cooperation. AirX doenst works. I buy Mac Blu-ray Player only if AirX works. I have a pc with windows 8 and a ipad 4 and a iphone 5. But it doenst works. I see the start-screen of airx.tv and if i click the film … the browser (Safari) cant connect and writes an error after about 30 Sec. I tested to change some settings of my Internet Router. Port Triggering of the Port 20012 (with TCP and Both (UDP and TCP)). But nothing happend. I have tested it without my firewall on the pc. Nothing. And i wrote to your support. They only wrote me, that airx dont works with ios 6 (???). Which Iphone have an older version than 6.*? And please dont write, that a support will help … !!! I am very sorry. But there is really a problem with our AirX, our colleague are working at it, Please give us more time. When this bug is solved, I will inform you soon. Thanks for your cooperation. When will the Airx.tv be fix? Just bought the software then notice Airx.tv not working. Same error “operation could not be completed” Thanks! Thanks for your supports! We are doing our best to solve this problem, Please wait a few days. I will inform you as early as possible. I feel very sorry for you and thanks for your patience. I will inform you as soon as when this bug is solved. Our colleagues are devoted to work it out. Please wait a few days, Thanks again. I’m also waiting for AirX to work – hope you guys get it fixed soon. BTW. are your affiliated to http://www.ideerapp.com? It looks like the same player, no? At least it appears that you’re sharing the same airx.tv site. I also know you are waiting for AirX, so we are doing our best to fix, please! I will inform you once it solved. No response? Is this product still alive? Just as you said, our company really founded in 2005, but I want to say that before this, we had done OEM for some company. So in some senses, those experience had paved the way for our foundation. Thanks for your attention and please like us and our products. When is AirX supposed to be fixed? It’s June 20, 2013, and AirX has been broken since last year. I get “The operation could not be completed” error on my iphone/ipad whenever I try to use it. As to the AirX, I’d like to tell you that we are working quite hard on the next version 3.0 which will support the full menu function. And after that, we will fix the issue of AirX. Thanks so much in advance for your understanding and I’m really sorry for all the inconvenience we had brought you! any news about the airx function? When will it work, it was the main reason why I bought the software. As to your question, our tech-department are working hard on this issue now. We try to update the airx function on ios6 in future versions. If have come out new versions we will inform you to update. It is now January 24, 2014. When will airx work? I am using the very latest version and still nothing. I am using IOS7 on iPhone and iPad. As to your question, I’d like to explain that now all our engineers are focus on realizing the Blu-ray menu function and have released the version 2.9.8 Blu-ray menu version until now. We will contact you once the bugs have been fixed completely. Thanks in advance for your understanding and Best wishes! I’ve been using Mac Bluray Player for a while now and love it! When I saw the Airx feature I felt compelled to purchase a license as this would add a very much needed functionality. So to my surprise I find it errors out with “The operation could not be completed.” Digging through the forums only to find this problem is over a year old and there has been no fix. I am very disappointed and will be asking for a full refund. Thanks so much for using our software and I’m sorry for the delay in response. 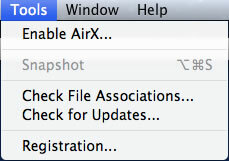 As to your problem, I’m sorry to tell you that our software do support AirX on iOS5 at the present time. And now all our engineers are focus on realizing the Blu-ray menu function and have released the version 2.9.8 Blu-ray menu version. Could you wait some time and will update this function as far as we can. I only bought your product to use Airx, bought it some time ago, and was hoping you would fix the problems, but it still don´t work, when will you have it fixed? I’m sorry for the inconvenience we brought to you at the present time. Our engineers are working hard on the Blu-ray menu updating at the present time. Then we will fix the bugs on AirX with iOS 8 after Blu-ray menu function is stable and reliable. Please help to be more patient and wait for our future updated versions. As to your problem, I’m sorry to tell you that our software still have issue for AirX function on iOS8 at the present time even we have prilimilary fixed some bugs. And now all our engineers are focus on realizing the Blu-ray menu function and have released the latest version 2.11.2 Blu-ray menu version.